Aerodynamicists use wind tunnels to test models of proposed aircraft and engine components. During a test, the model is placed in the test section of the tunnel and air is made to flow past the model. Various types of instrumentation are used to determine the forces on the model. 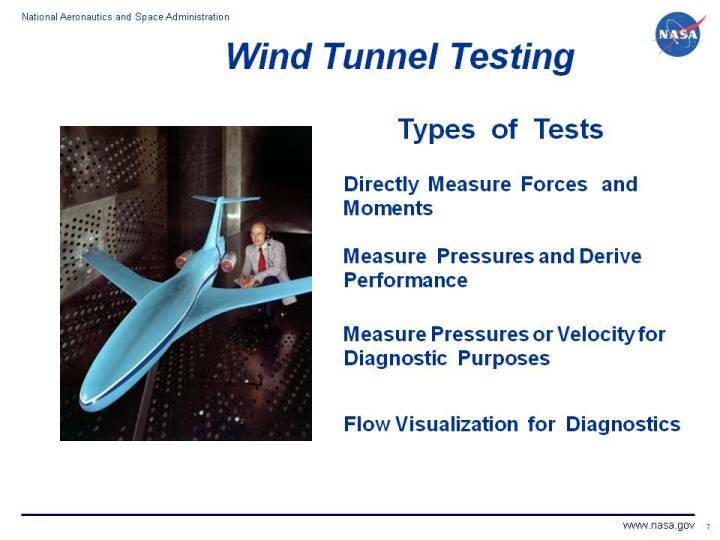 There are four main types of wind tunnel tests. In some wind tunnel tests, the aerodynamic forces and moments on the model are measured directly. The model is mounted in the tunnel on a special machine called a force balance. The output from the balance is a signal that is related to the forces and moments on the model. Balances can be used to measure both the lift and drag forces. The balance must be calibrated against a known value of the force before, and sometimes during, the test. Force measurements usually require some data reduction or post-test processing to account for Reynolds number or Mach number effects on the model during testing. It is very important in data reports to always specify the reference value of variables used in data reduction. In some wind tunnel tests, the model is instrumented with pressure taps and the component performance is calculated from the pressure data. Total pressure measurement is the normal procedure for determining aircraft inlet performance. Theoretically, the aerodynamic force on an aircraft model could be obtained using pressure instrumentation by integrating the pressure times an incremental area around the entire surface of the model. But, in practice, pressure integration is not used because of the large number of taps necessary to accurately resolve pressure variations. Airfoil drag can be determined by integrating the total pressure deficit in the wake created by a wing model. In some wind tunnel tests, the model is instrumented to provide diagnostic information about the flow of air around the model. Diagnostic instrumentation includes static pressure taps, total pressure rakes, laser Doppler velocimetry, and hot-wire velocity probes. A diagnostic test does not provide overall aircraft performance, but helps the engineer to better understand how the fluid moves around and through the model. There are a variety of flow control devices that are employed to improve performance of the aircraft, if the local flow conditions are known. Depending on the type of instrumentation used in the experiment, steady state flow or unsteady, time-varying, flow information can be obtained. The engineer must use some experience when employing flow diagnostic instrumentation to properly place the instruments in regions of flow gradients or separations. In some wind tunnel tests, flow visualization techniques are used to provide diagnostic information. Visualizaation techniques include free stream smoke, laser sheet, or surface oil flow. The assumption is made that the flow visualization medium moves exactly with the flow. Shadowgraphs or schlierin systems are used to visualize the shape and location of shock waves in compressible flows. For low speed flows, tufts or surface oil indicate the flow direction along the surface of a model. You can investigate some wind tunnel testing techniques by using our interactive tunnel testing applet. More experienced users can use the TunnelSys application programs to perform model design, testing, and performance post-processing.